COG Digital is a leading Sydney Digital Agency. Having been around for 10+ years, we have heard a huge range of questions to do with SEO, Ecommerce and Digital Marketing. One common question that we get asked is, “I’m an Australian business but I want my website to be seen by international users. What domain should I purchase? 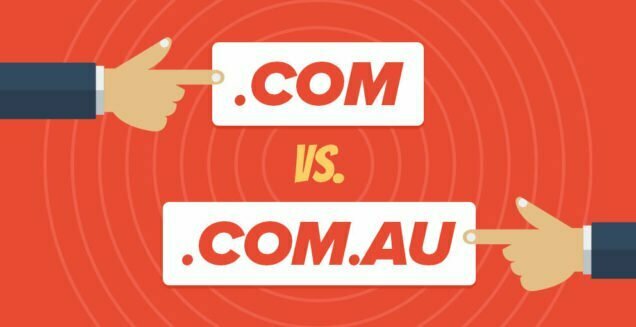 A .com.au or a .com? Technically speaking, the primary difference is .com.au identifies your website as an Australian business. When registering a .com.au you must have an ABN or ACN to verify that you are in fact an Australian business. Anyone can register a .com without any verification. This builds trust within the Australian market and the user knows they are visiting the site of a recognised local business. Search Engines such as Google, Bing and Yahoo recognise the geographical location of internet searches and make the assumption that if the searcher is located in Australia, then Australian businesses are more relevant and will rank these pages higher than their global .com counterparts. This is a significant advantage to helping your website appearing on the front page of search engines. But as we mentioned earlier, what if you’d like your website to attract international users? Then it may be smarter for you to choose a .com. At COG Digital we audit your exisiting website (if applicable), competition, market, target audience, and then present to you the best solution for your specific business model. In some instances we recommend businesses to purchase both domains and have them both point to the same website. This can be an easy solution depending on your business and scale of operations. However as digital experts we also know that this method can be problematic. Buying then redirecting a variety of different sites to the same URL can be considered as spamming by search engines, which can reflect negatively on your search engine rank. It is for this reason that we perform a comprehensive analysis to determine the best course of action for your business. In relation to cost, the pricing between the two is minor with a .com.au slightly dearer. Essentially this is because you are getting the benefit of higher ranking in Australia’s search engine market. At COG Digital we are digital marketing experts. Call us today on (02) 9523 6007 and help your business gain traction online!